Large circular bench ca 25' in diameter forms ring with hour markings. Aluminum or stainless steel gnomon. Relatively new. At the Cahokia Mounds is a woodhenge discovered in the early 1960's during excavations and has been reconstructed. There are a series of wood posts in multiple circles that indicate various solar events such as the solstices, equinoxes, and what are thought to be special festival days related to the agricultural cycle of the region. Critical posts also align with the mounds of the site on certain dates. The outer of 3 circles of posts has a diameter of 410 feet with 48 equidistant posts. Each post is about 20 feet high. Equinox and solstice sunrise observations are held at the site on the Sunday morning closest to the event. Bronze horizontal dial on a granite base. Has Roman numerals showing time noting "Mean solar time in Halifax is 1 hour and 14 minutes behind Atlantic Standard Time." Bronze on stone. Renovated 1904 and again in 1994 (by George McDowell.). It is a 17-facet hemispherical compendium dial. Has facets calibrated for local solar time for Baltimore, Jeddo [Tokyo], Honolulu, Sitka, Pitcairn Islands, San Francisco, Cape Cod, Rio Jancito, London, Fernano Po, Cape Town, Jerusalem, and Calcutta. Has a polar and vertical dial for Baltimore time. Built in 1892 by Peter Hamilton, 19th C Baltimore stonecutter, became president of the company which supplied granite for the Library of Congress building. Repaired and reset in 1904. Reworked in 1993. The original pedestal remains, consisting of a stone pillar carved to resemble the trunk of a tree. The Kentucky Vietnam Veterans Memorial features a 7090 square foot plaza with a monumental 86x68 foot horizontal dial of granite slabs with a 14.6 foot high gnomon of welded stainless steel plates. The dial design places the shadow of the tip of the gnomon on each of 1103 veteran's names on the anniversary of his or her death. MIA names are engraved in an area where the shadow never falls. The dial face identifies one hour of time for each year of the 1962-1975 Vietnam War. The 327 granite slabs from the Pyramid Blue quarry in Elberton, Georgia are a maximum of 12x3 feet, are 4 inches thick and are placed atop 800 concrete piers 28 inches high to provide drainage and protection from frost heaving. Reconstruction of a 4-sided pillar dial. A 6 foot diameter wrought iron armillary with equatorial and polar rings. Hour numerals are missing. Cast zodiacal signs are present in fair condition on exterior of equatorial ring. Dial is on a decaying brick circular pedestal at the center of a concrete and brick base. Rings are heavily marked with graffiti. The dial sits atop a brick and mortar pedestal in poor condition. Vertical dial on a board, about 1.5m high by 1 m wide. White with red lettering. It is placed above a doorway on an interior courtyard of the old Seminary, founded in 1663 by Mgr de Laval. The building now houses the architecture school of the Laval University. Although the school and Seminary buildings are private, access is available to the courtyard. Large vertical dial at the Shakespeare Festival Theatre entrance. The dial is formed around a large circular sunburst with Roman numerals at the edge. Gnomon is missing. Dial declines east and is non-functional for this position and location. Above the dial is a shield. 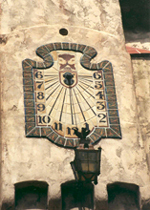 The original sundial was a gift of US Time Corp., as Timex was then known. This dial was of sheet metal and is substantially rusted, with pieces missing. The original dial was removed and will be replaced as another gift of Timex with a new dial built by Global Scenic Services with engineering and testing by a Timex engineer. The new dial will use templates from the original dial for replication but is built with modern materials for better weathering. The new dial will be calibrated for EDST. Waugh memorial dial. Not oriented on cardinal points. It was rotated to avoid tree and adjacent building shadows. Gift of Mr. & Mrs. Kenneth Lynch Sr., the Alumni Association, and funds raised for the purpose. The stone pillar is 12 ft. high. Constructed by the firm of Kenneth Lynch & Sons. 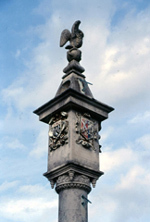 A 22 ft. high stone pillar dial built by William Ross Carpenter as a replica of the famous Charles Turnbull dial of Corpus Christi College in England dating from 1577. The pillar has multiple dials of various types. The Carpenter replica built in 1912 was restored in 1987. Ornate dial furniture with multiple inscriptions. A complex masterpiece. See the NASS Compendium Vol. 2 No. 1 for more details. Bronze horizontal ring, suspended by curved semi-circles, with gnomon rising from the center toward the North. "...you can see resemblances to an anchor, a gimbal, and a mariner's compass" says designer Searle Lansing-Jones. Built in 1913 as a promotion for a housing development that was once a racetrack, this dial boasted (incorrectly) that at 34 feet in diameter and 28 foot gnomon it was the largest dial in the United States. Nevertheless it gathered much publicity and newspaper articles of the day showed young girls dancing around a small pool that surrounded the gnomon. Bronze statues of porpoise were said to be in the pool. Today the statues are gone and the pool is green painted cement. Still, an interesting dial to visit. This dial was originally owned and installed at Sea World in San Diego but was sold and purchased by Verlyn Kuhlmann. A 39 inch diameter reclining vertical dial of cast concrete with a 20 inch long steel gnomon. Dial reclines about 50°. Includes cast hour lines with Arabic numerals and longitude correction. A separate plaque provides instructions and an EOT graph. The dial is mounted on a 24 inch square aluminum base plate and short column support. A 7x8 foot direct south facing vertical dial of wood with metal gnomon on the masonry stucco side of a fire station building. Hour lines are painted on wood planks bolted to the side of the building. Metal Arabic DST hour numerals are mounted to the wood planks. Longitude correction is not included and there is no EOT correction or instructions offered but dial is accurate when both corrections are applied. When built in 1978, the hour numerals marked Standard Time; when rebuilt sometime before 2010, the new hour numerals now mark daylight saving time. The fire station building wall declines approximately 18.5? east of south but the wall area holding the dial has been built out to correct (perhaps not quite enough) this angle. A bronze equatorial ring dial with taut wire gnomon on concrete pedestal. Ring is inscribed with hour, ten-minute and minute lines. Plaque states the dial indicates correct watch time so observatory staff periodically rotates clamped ring to correct for EOT, longitude and DST. Dial is located adjacent to the Astronomers Monument atop which is a large bronze armillary. The monument recognizes Hipparchus, Copernicus, Galileo, Kepler, Newton and Hershel. The sundial was originally built into the base of the Astronomers Monument but was relocated a few feet to the south during the 2002-2006 remodeling to allow visitors to more closely approach the dial. The dial sits atop a concrete pedestal.